While Edward Hopper's Nighthawks may not have the same effect on you as, say, the Mona Lisa, its influence on pop culture, TV, cinema, music, and literature is undeniable. Leonardo Da Vinci's Salvator Mundi, Willem de Kooning's Interchange, Edward Hopper's Nighthawks, Jackson Pollock's Number 17A, Pablo Picasso's Version O, Roy Lichtenstein's Masterpiece. Can you spot the odd one out of these masterpieces? If you guessed Nighthawks, then you guessed right, but not because it's the only one amongst the aforementioned paintings sold for less than a $100 million - it was bought by the Art Institute of Chicago in 1942 for a paltry $3,000. No, it's because no other painting on that list can claim to have had anywhere close to the influence Nighthawks has had on popular TV culture, cinema, music, and literature. 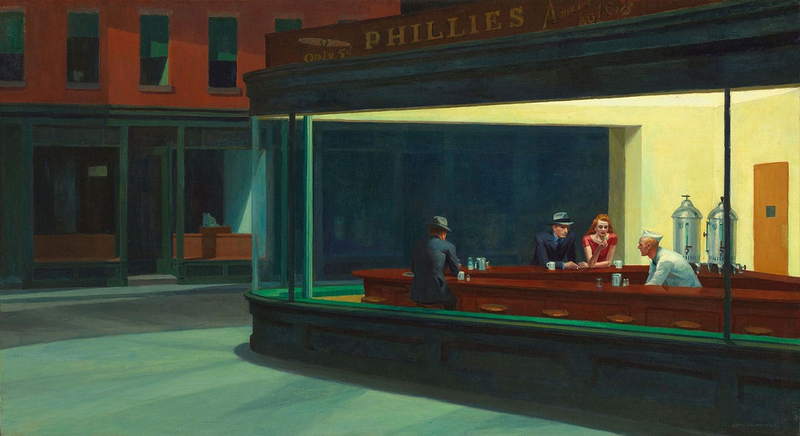 Painted in 1942, it depicts four people at a diner late at night and has been portrayed on film and television countless times since its inception, serving as the model for many homages and parodies. Hopper's diner is situated at the intersection of two streets and is said to have been inspired by a diner in Greenwich Village, his neighborhood in Manhattan. But what exactly is it about this particular painting that it has inspired hundreds of artists, directors, and writers in the decades past to incorporate it into seemingly mundane scenarios as a homage to Nighthawks? Is it a product of sheer chance or is there something about it that has influenced pop-culture to such an extent that it has been recreated in a legion of tropes? There was little initial fanfare surrounding Nighthawks. Upon completion, Hopper placed it on display at Rehn's, the gallery where he normally put his paintings up for sale. It went unsold for an entire month before it caught the attention of Daniel Catton Rich, the director of the Art Institute of Chicago. Upon laying his eyes on it, Rich proclaimed the painting to be "fine as a (Winslow) Homer" and promptly purchased it for $3,000; an absolute steal in today's art climate, where it would undoubtedly be worth in the hundreds of millions, if not for its aesthetic value, then most definitely for how ever-present it has been in pop-culture since its inception. Maybe the first to incorporate Nighthawks into his work was prominent photorealist Ralph Goings, who along with Robert Bechtle, Robert Cottingham, Audrey Flack, Don Eddy, and Richard Estes, helped define the photorealist movement. 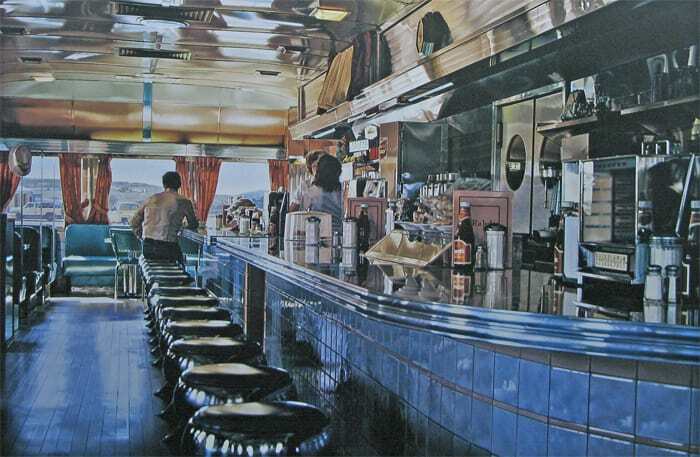 Goings evoked Nighthawks in several highly-detailed paintings of diners, most popularly Amsterdam Diner (1980), Ralph's Diner (1981-1982), Village Cafe (1990), Diner (1990), and several more. A more subtle homage to Nighthawks came in the form of Richard Estes' People's Flowers (1971). On first glance, the painting offers little in common to that homely late-night diner in Hopper's painting; it's a flower shop set in broad daylight with little of the inside visible. 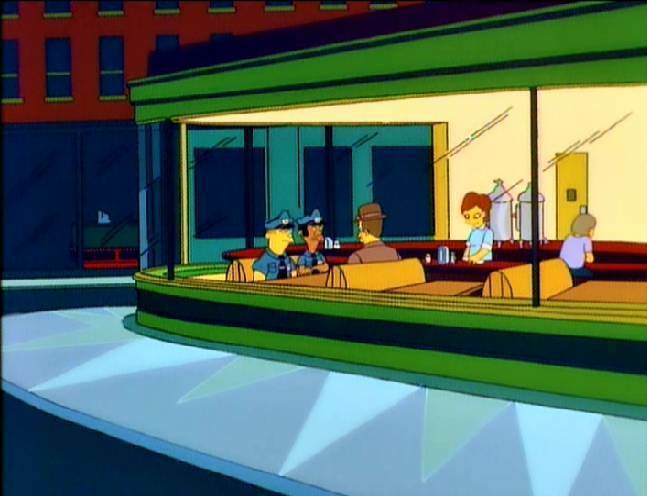 But a closer look reveals Nighthawks' influence - the shop's location purposely chosen to be at the intersection of two streets, and the windows reflecting the street and the sky. Roger Brown's Puerto Rican Wedding (1969) also referenced the painting in a subtle manner, with the cafe in the lower left corner a sort of homage to Hopper's work. Brown himself admitted that while that cafe was not set up like an imitation of Nighthawks, it still "refers to it very much." While these initial tributes were less than apparent unless one paid close attention to the paintings in question, more direct visual quotations began to emerge in the 70s. Austrian-Irish visual artist Gottfried Helnwein painted the most obvious spoof of Nighthawks with his Boulevard of Broken Dreams (1984). Helnwein's work primarily focused on psychological and sociological anxiety, or the human condition in particular, with Boulevard of Broken Dreams addressing a raging issue at the time: early celebrity deaths. 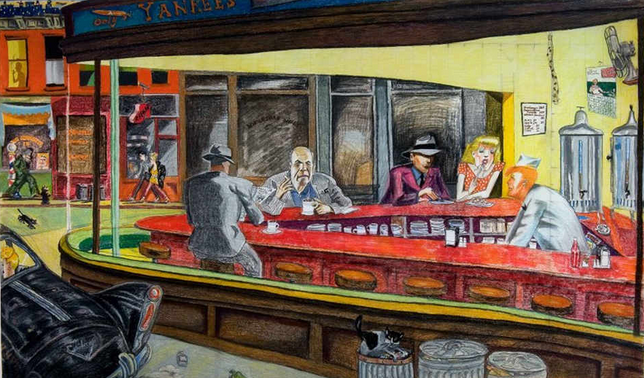 The painting replaced the three original patrons in Nighthawks with three American pop culture icons in Humphrey Bogart, Marilyn Monroe, and James Dean, and the attendant with Elvis Presley. 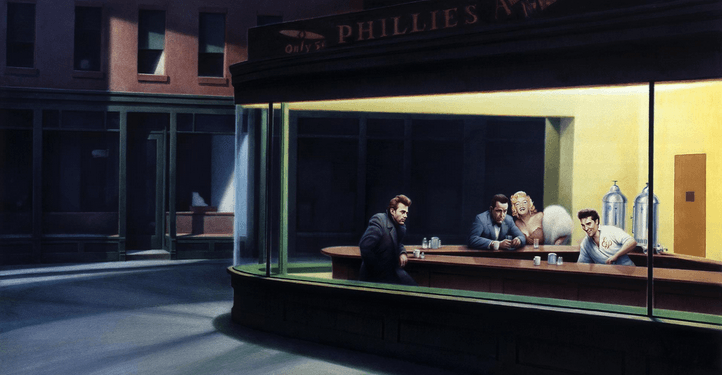 According to scholars, with it, he attempted to connect the bleak mood of Nighthawks with 1950s American cinema and with the tragic fate of the decade's most beloved celebrities. Like Boulevard of Broken Dreams, several other parodies also retain the diner and the highly-recognizable digital composition of the painting, but as a rule, replace the patrons and attendant with other characters, be it animals, TV show characters, or a plethora of other possibilities. One such parody was in the form of Red Grooms' Nighthawks Revisited (1980) and a street art by graffiti artist Banksy. The former portrays a much more hectic scene: there are numerous pedestrians stalking the streets outside, a car noisily makes its way across the road, a cat forages its way through the trash cans outside, and most notably, the diner has one extra patron — a fat, balding man who appears to be holding a cigarette in one of his hands. Purposely painted so, it betrays the calmness of the original to depict a more realistic scenario. Banksy, known for his satirical work that tends to incorporate dark humor and delivers social and political commentary, gave his own take on Nighthawks in 2005. His parody shows a fat, shirtless soccer hooligan in Union Flag boxers standing drunk outside the diner, and can be seen having just smashed the diner window with a nearby chair and the patrons inside are seen worryingly glancing at the man. One parody of Nighthawks even inspired a parody of his own. 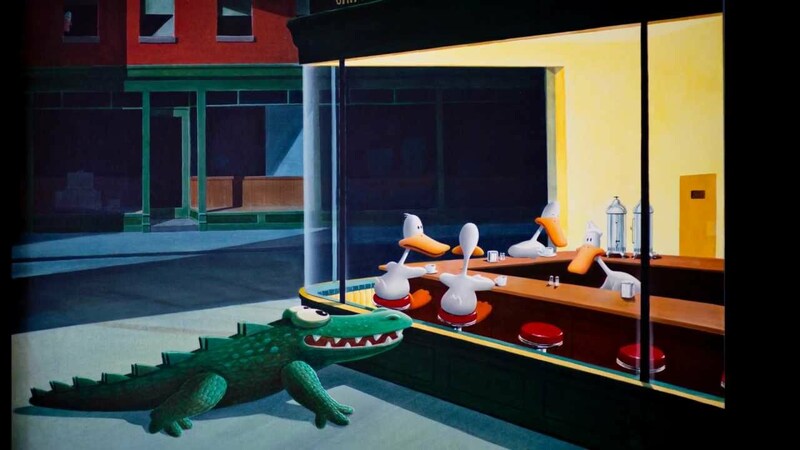 Michael Bedard's painting Window Shopping (1989) was a part of his Sitting Ducks series of posters and replaced the figures in the diner with ducks. It also portrayed a hungry crocodile outside the diner wantingly eyeing the chicks inside. Poverino Peppino then parodied this parody with his Boulevard of Broken Ducks (1993), in which the roles are practically reversed. In his painting, a satisfied and content crocodile lies on the counter while the four ducks stand outside in the rain. An avid moviegoer, many feel Hopper's numerous paintings, including Nighthawks, were influenced by film noir, and later themselves went on to influence its development. Director of Blade Runner, Ridley Scott, as much admitted to the painting playing a significant role in the future noir look of his megahit, saying: "I was constantly waving a reproduction of this painting under the noses of the production team to illustrate the look and mood I was after." Nighthawks' depiction of an overwhelming sense of separation and a feeling of being cut off from the rest of the world was also used by Glengarry Glen Ross (1992), which starred names such as Al Pacino, Alec Baldwin, and Kevin Spacey. Centered around two salesmen who suddenly have the rug pulled from underneath them, the film has the two characters visiting a cafe resembling the diner to illustrate their solitude and despair. The painting also made an appearance in Pennies from Heaven (1981), where the scene was recreated on set, The End of Violence (1997), and Heavy Traffic (1973). But why is that it has become such a prominent trope in so many films? Director Wim Wenders feels that the paintings appeal to directors because "you can always tell where the camera is," a sentiment many can wholeheartedly agree with and understand. It has thus also found its way into countless TV shows, and as it always is with TV shows, The Simpsons did it first, they did it accurately, and they did it several times. A shot from the episode "Homer vs. the Eighteenth Amendment" is one of just several references to Nighthawks in the long-running show. This particular still has reworked the interior of the diner but maintains the painting's general demeanor and has police officers Lou and Eddie sitting across another gentleman. That 70s Show also expressed its adulation toward the painting with the episode "Drive in." 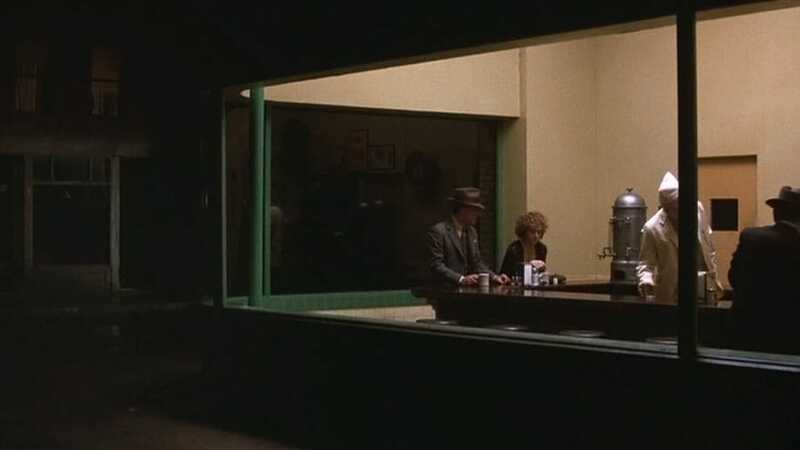 In the episode, a scene ends with Red and Kitty Foreman sitting in a diner named "Phillies," keeping the same name as the one in Nighthawks, with Kitty proclaiming that the scene feels familiar. The camera then zooms out, showing Nighthawks with Red and Kitty wearing a black suit and red dress respectively - similar to the patrons in the original painting. Movies, TV shows and paintings, yes, but Nighthawks has also crept into music and literature as well. 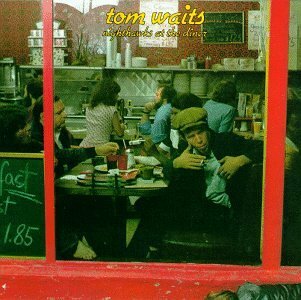 Tom Waits' first live album Nighthawks at the Diner not only borrowed the title of Edward Hopper's painting but was also mentioned in the single 'Eggs and Sausage' and referenced to in the album cover as well. Not surprising then, that the album received critical acclaim for its mood-setting and captures the jazz-club atmosphere and was named in the book 1001 Albums You Must Hear Before You Die. Similarly, the video for Voice of the Beehive's song 'Monsters and Angels' was set in a diner reminiscent of the one in Nighthawks. The band members played the roles of the waitstaff and patrons, with their website admitting to being inspired by Edward Hopper. Orchestral Manoeuvres in the Dark's 2013 single 'Night Cafe' was also influenced by the painting. The song mentions Hopper by name, and seven of his other paintings are referenced in the lyrics as well. While its influence in literature has been minimal, it has made way for some spectacular works. Wolf Wondratschek's poem "Nighthawks: After Edward Hopper's Painting" delves into the lives of the man and the woman inside the diner, Joyce Carol Oates wrote the interior monologues for the figures in the painting in her poem "Edward Hopper's Nighthawks 1942," and a special issue of Der Spiegel included five brief dramatizations that constructed five different plots around the painting; one of which, written by screenwriter Christof Schlingensief, turned the scene into a chainsaw massacre. 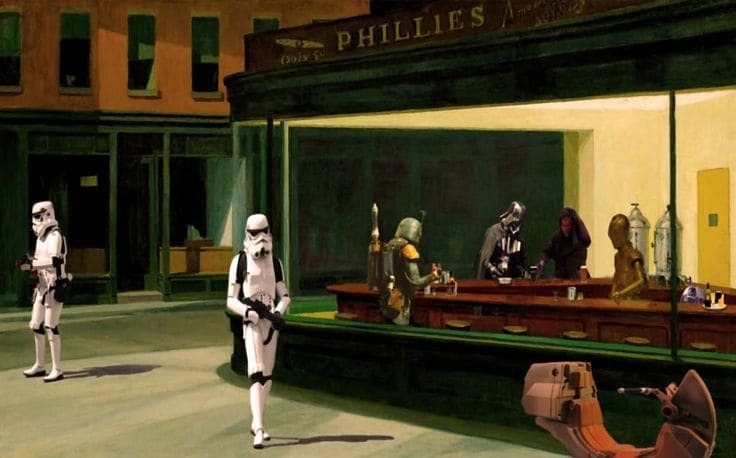 There's little doubt that as the years pass by, several more artists, writers, and directors will attempt their own homage to Nighthawks, and while the painting may not have the wow-factor of some of the more prominent works, neither will its impact on pop-culture be forgotten, and nor will it cease to amaze. Nighthawks will live forever through its tropes.